Morphological characterisation of 2,298 accessions collected in Indonesia, Malaysia, Thailand, Vietnam, the Philippines, Papua New Guinea and Vanuatu was conducted with 23 standardised descriptors and data bases were developed. More than 2,000 cultivars were electrophoresed on starch gels and six enzyme systems were revealed successfully (MDH, PGI, ICD, PGD, ME, SKDH). Each country selected a core sample for sharing composed of elite cultivars representing approximately 10% of the total number of accessions. Ploidy levels were determined using flow cytometry. AFLP fingerprinting was conducted on all cultivars included in the core sample. Meristems were excised and these genotypes were tissue cultured, indexed for DMV and distributed to participating countries. In Vanuatu, 378 cultivars were grown in a common plot, planted and harvested the same day, and their corms were boiled and submitted to a blind panel test composed of ten participants. Their eating quality was scored on a scale from 1 to 6 (excellent). 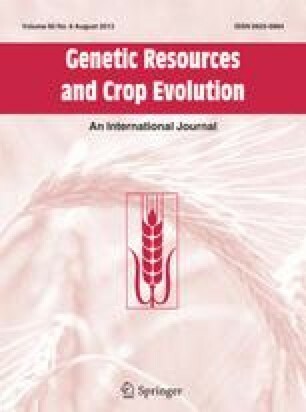 The physico-chemical characteristics of 31 cultivars, representing different morphotypes and including excellent and poor cultivars, were analysed to assess the extent of variation existing for traits related to corm quality (dry matter content, minerals, lipids, proteins, gelatinisation temperature, amylose, glucose, fructose, saccharose, maltose and starch content). The results of these studies indicate that the genetic base of the cultivars is narrow. Only six zymotypes represent more than 51% of the total number of accessions electrophoresed and only 21 zymotypes represent more than the two thirds (70%) of the total number of accessions. AFLP analysis confirm the isozymes results and two distinct genepools are revealed, one in S.E. Asia and the other in the Pacific. It implies that crosses between accessions originating from only one country are not desirable and it is appropriate to cross cultivars from both genepools. Except for the temperature of gelatinisation, all physico-chemical characteristics are variable. Good taste is correlated with high dry matter, starch and amylose contents.